Jane wants Billy and Nick to bond and decides to hang out together but as she goes into work and is asked by socialite Charlotte Whitmore (Autumn Reeser who played Taylor Townsend in the OC) what she thought of Donovon Decker's wedding dress, she is forced to tell the truth about it being too 'clumsy'. With only 24 hours to come up with a new design, Jane has to miss meeting Nick and Billy and spends the night helping with coming up with a design. India finds Jane's finished drawing and takes it to Jeremy, claiming it as her own... which causes uproar when Jane finds out. 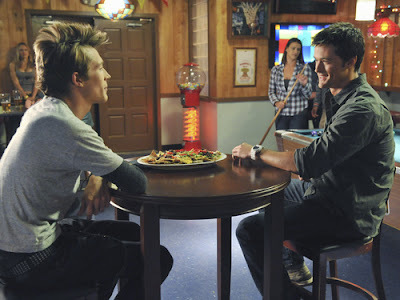 Meanwhile, Billy and Nick have a very awkward time together until they start playing pool and begin to bond, but end up in a fight with two Adam's, who Nick will be playing against in the next day's baseball game. 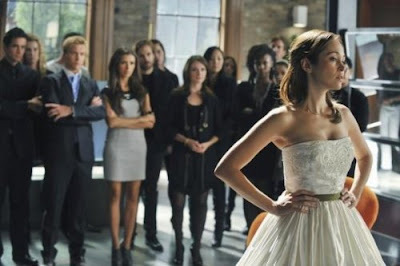 Once the dress is finished, Jane is asked to try it on being the only one around the same height as Charlotte and she discovers that she was inspired by her mother's wedding dress, proof that she designed it. Jeremy asks India why she did it and then breaks up with her. India calls [Richard] who sent her a bunch of flowers earlier on in the episode which India throws in the bin, wanting to develop her relationship with Jeremy. Jane decides no to rat India out to Gray. Charlotte returns the next day to see the dress and loves it. Jane makes it on time to Nick's baseball game... seems like things are finally working out for Jane!! Next week seems intense as Jane has to choose between love and her career, with Nick potentially kissing Lulu!? WTH nooooooooooooooooooooooooooooooooooooo!! very good article and enlightening for us who still lay this.